If you're planning a couples' getaway or a family reunion, you might think about a rental villa as an alternative to a hotel. The last time I traveled with a group was for a family reunion on the Jersey shore. The resort was lovely, but when we wanted to be together, we had to find space in the lobby with the other guests or break up into small groups to meet in our cramped hotel rooms. We missed having a private space where we could hang out and not deal with other people. Recently my wife and I planned a weekend with four other couples. 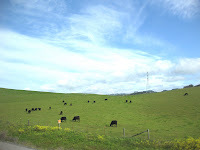 We were going to meet in the Sonoma Valley where we like its bucolic mix of small towns, cafes, vineyards, dairies, farms, and ranches. For foodies, with hundreds of organic farms, world famous wineries, and access to fresh seafood, the valley is nirvana. We only needed to decide where to stay. At first we considered one of the luxury hotels in the area: Meadowood, Auberege du Soleil, or the Calistoga Ranch. There's no question a hotel has advantages. Fresh towels every day. Someone else making up your bed. Room service whenever you're hungry. Little chocolates on your pillow at night. Those luxuries are a treat. So is having easy access to the hotel's restaurants, bars, pool, spa, and recreational facilities. But for all that convenience there are trade-offs. As we learned at the family reunion, the public spaces aren't your own. Your room will be small. 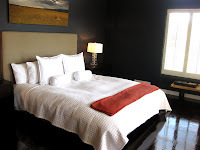 And with room rates ranging from $550-850 per person, per night, the cost of all those luxuries and conveniences can be pricey, even with the discounts many hotels are currently offering. The other option was a villa rental. Until you've taken your first rental-vacation, the idea can be daunting. Will you have to give up the ease and comfort of a hotel? How difficult will it be to find the right place? What about pricing? The first step is to send around an email work sheet to your group and ask some basic questions. Where do you want to go? In the U.S. or out of the country? Do you want to be in a big city, in the country, or somewhere in between? For how long? A long weekend, a week, a month, or longer? How much do you want to spend a night? What amenities do you want at the house? A pool and a spa? What about tennis courts? What kind of activities do you want for the visit? Do you want to focus your vacation at the villa or would you rather use the rental as a jumping off point to explore the area's recreational, cultural, or culinary opportunities? Once everyone is on the same page, begin your search. Go on line and look for "vacation rentals" in an area or city of interest. Or try one of the many web sites that arrange rentals. Each site has a different profile. Some focus on specific areas of the country or foreign locations. Some target upscale travelers. 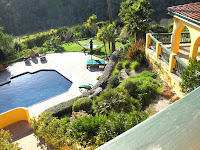 For properties in the U.S., check out Zonder (www.zonder.com), HomeAway (www.homeaway.com), GreatRentals (www.greatrentals.com), and WeNeedAVacation (www.weneedavacation.com). Owners in the U.S. and around the world also list their homes at VRBO (www.vrbo.com) and VacationRentals (www.vacationrentals.com). Beautiful Places (www.beautiful-places.com) specializes in high end properties in the U.S., Mexico, Italy, and France. Sanctuary Villas (www.sanctuary-villas.com) and In Villas Veritas (www.invillas.com) offer luxury accommodations in Europe and along the Mediterranean coast. Prices are as varied as the properties. On a recent check of HomeAway, there were no-frills 1 bedroom houses for under $130/night, while luxury accommodations with 4-6 bedrooms were priced twenty times that amount. The location, number of bedrooms, and amenities will all affect price. You can find a house in just about any price range, but no matter what, traveling with a group, you'll save money. When you go can also make a big difference. Generally speaking, you'll pay full fare during the high season, 10% less in the shoulder, and another 10% discounted in the off-season. One region's high season is another's off season. In Napa and Sonoma in the California Wine Country, the Low Season comes at the end of the harvest (November - March). The Shoulder Season is in April and May. 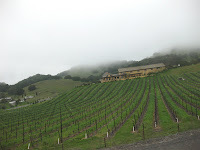 During the High Season (June - October) Napa and Sonoma are busy with activity as tourists fill the valley. For skiing areas like Aspen and Park City, their High and Low Seasons follow a reverse calendar. When you stay at a hotel you pretty much know what you're getting. Renting a private home is different because the house reflects the personality and taste of the owner. Look carefully at the photographs you see on line or receive from the broker. Do you like the furniture? What about the art on the walls? Pay attention to details. They could affect the quality of your vacation. If you can talk with the broker or the owner, ask questions. Is the pool heated? Are pets allowed? And kids? If you want to cook while you're there, ask about the kitchen. If you want to barbecue, does the property have a grill? What is the neighborhood like? Is the house close to shopping areas? Will you need a car? Get as much information as you can. The more you know, the happier you're more likely to be during your vacation. Ask about support as well. Is a rental agent available during your stay? If there is a problem, will you get help or are you on your own? Some web sites offer reimbursement and replacement guarantees if you aren't happy, but that would be cold comfort for any group on a short visit. As a rule, the more you pay for the rental, the more services and support you can expect. 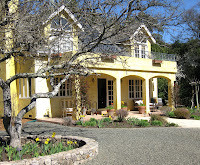 With the Sonoma Valley as our objective, we looked through the web sites that had listings for the area. We chose Beautiful Places because they had a wide range of properties, from smaller, idiosyncratic homes to large estates with vineyards, tennis courts, pools, and spas. The agent at Beautiful Places asked how many bedrooms we wanted, were we bringing children or pets, did anyone in our party have physical limitations that should be taken into account, how long did we want to stay, did we want to be in town or in the country, what amenities did we want, and what was our price range? As we considered several properties, we spent a lot of time on the phone and in emails with the agent. She seemed to understand exactly what would make us happy, but, of course, we would only know if we had made the right choice once we arrived and opened the front door. On the web site, Villa Andrea (http://www.beautiful-places.com/winesearch/villa_andrea-3) looked amazing. Surrounded by a thirty acre vineyard, the v illa had all of the amenities of a luxury hotel: beautiful grounds landscaped with native plants, an elegant pool, and a patio that overlooked the estate's private vineyard. The description of the villa said that in addition to the outdoor jacuzzi, there was a spa with a steambath, sauna, and relaxation room. For entertainment, almost every room had a flat screen tv. Because the owner is a movie buff, we could use his state-of-the-art screening room. For exercise there was a bocce ball court and a tennis court fitted out with bleachers, in case we wanted to rally a crowd. Three of the bedrooms were in the main house. The other two were in separate bungalows for added privacy. Since we wanted to cook together, we needed a large, well-appointed kitchen. Beautiful Places promised us a "dream kitchen." We were told that there was an 8-burner stove with two ovens, two dish washers, and two plate warming drawers. Clearly the owner loves to entertain and he expected we would as well. Besides brokering the rental, Beautiful Places offered concierge services. They would arrange any number of activities: hang gliding, a ride in a hot air balloon, a private tour of a winery, difficult-to-get reservations at well-known restaurants like the French Laundry or Ubuntu. They could arrange golf packages or a helicopter tour of the valley. Their goal was to make our trip memorable. Once, they told us, for a NASCAR fan's birthday party, they arranged for race car driving lessons at nearby Infineon Raceway. Many of these activities would add to the cost of a visit but not all. Because of their relationships with local businesses, Beautiful Places arranged tastings and private tours at no additional cost. They could also provide in-villa services: massages, wine tasting, or a chef to cook on the premises. Daily maid service was also available and, split five ways--another advantage of traveling with a group--added very little to our costs. In the hills above Glen Ellen we turned off the two lane blacktop onto a narrow pr ivate road. We drove for five minutes through stands of trees draped with Spanish moss interspersed with views of the valley below where the green fields were covered with brightly flowered mustard plants. As we rounded a turn, we were stopped by a wrought-iron gate. We punched in the security code, the gate swung open. For the first time we could see Villa Andrea on the crest of the hill. Arriving at a property you've only seen on line is the moment of truth. We were welcomed by representatives of Beautiful Places who took us on a tour of the property. Given that we worried the villa wouldn't live up to the on line description, we were very happy that the photographs didn't do it justice. Everything about the house was both comforting and visually stunning. Balconies run the length of the house on the main and second floors, the better to enjoy the view of the pool and the mountain behind. The living room furnishings were elegantly cozy. Newly installed European bathroom fixtures with spa-style showers added to the sense of luxury. By painting the dining room a deep red, the owner proved he wasn't timid about using color. Clearly, he h ad given great thought to every detail and he had done this for himself. Now we were the beneficiaries. 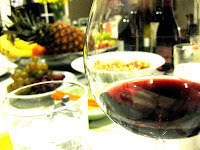 In the kitchen a fruit and cheese plate and a selection of wines were waiting for us. While we snacked and enjoyed a glass of Benziger Family Winery's Merlot, we reviewed the plan for the weekend. Since part of our group wanted to spend the vacation enjoying the villa, their time revolved around reading, eating, watching movies, and spending time in the s pa. For those of us who wanted to explore the valley's incredible culinary bounty, Beautiful Places put together a comprehensive itinerary. 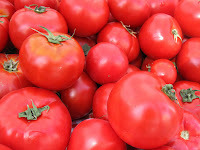 We started our tour of the valley with a stop at the Sonoma farmers' market a few blocks from the town square. 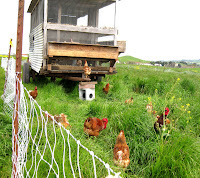 Then we drove out to the very organic Green Spring Farm (www.greenstringfarm.com) in Petaluma where chickens fertilize the fields and weeds control the insects. At the Benziger Family Winery (www.benziger.com), Bob Benziger gave us a private tour of their Glen Ellen vineyard where he explained the principles of biodynamic farming which were similar to the techniques practiced at Green String Farm. 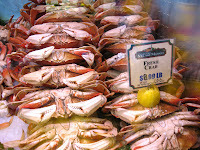 In Sonoma, we took our time walking around the amazing Sonoma Market (www.sonoma-glenellenmkt.com) looking through the extensive collection of local cheeses, wines, organic produce, dry aged beef, free range poultry, fish, and shellfish, including Dungeness crabs freshly cooked in the market's kitchen. We filled our shopping cart with food for the weekend and were tempted by the block long counter of prepared foods and the bakery with enough freshly baked breads and upscale desserts to satisfy an army of foodies. At Jack London Village in Glen Ellen we had a really informative tasting of artisan cheeses at Raymond Cheese Monger (www.raymondcheesemongers.com). Next door at Figone's of California Olive Oil and Press (www.figoneoliveoil.com) we sat at the bar and tossed down shooters of the locally produced olive oils and balsamic vinegars. Back at the villa, we unpacked our goodies. Everyone gathered in the kitchen. Those of us who wanted to cook, cooked. The others kept us company and were available to sample what we had bought. A wine tasting happened spontaneously. 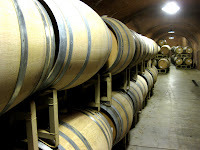 We still had our welcoming gift of Benziger's delicious Merlot and, when we toured the winery, we picked up bottles of the Chardonnay 2006 (Sangiacomo Vineyards, Carneros) and Pinot Noir 2006 (Sonoma Coast, Quintus Vineyard). We didn't cook anything overly complicated. With such fresh, high-quality ingredients, simple preparations were best. 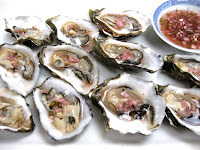 We started off with Hog Island oysters from nearby Tomales Bay. 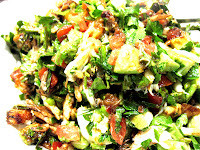 The body meat from two Dungeness crabs added sweetness to a parsley-tomato-avocado salad dressed with olive oil and balsamic vinegar we bought at Figone's. Freshly made tagliarini pasta from Wine Country Pasta was tossed with garlic sauteed kale raabe we picked up from Oak Hill Farm (www.oakhillfarm.net) at the farmers' market in Sonoma. A dry aged ribeye steak from the Sonoma Market found its way onto the outdoor grill. Dessert was a delicious wedge of Ig Vella's (www.vellacheese.com) locally produced Dry Jack and a jar of summer peaches from Green String Farm. Beautiful Places suggested that we have a private chef come to the villa so we didn't spend all our time cooking. 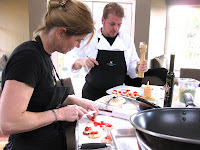 The cost would be the same as a dinner at a restaurant, but how much more fun to have Margie Tosch and Willy Brooke of Meadow Brooke Catering (www.meadowbrookecatering.com) prepare a wine-paired meal in the villa. Adding to the evening, Beautiful Places arranged for a screening of Bottle Shock. The film dramatizes the 1976 competition in Paris when two California wines were judged better than their French counterparts. Marc and Brenda Lhormer, producers on the film, told us behind-the-scenes stories about the making of the film in the valley (and all the wine that had to be tasted along the way). They brought a selection of Sonoma wines for us to sample. For our last night we had a private wine tasting with Garrett Day of Provino (www.provinowines.com) who introduced us to Sonoma Valley's smaller and very remarkable vintners. Having a kitchen turned out to be the best part of the trip. Hanging out together where we could cook, eat, sample wine, and just talk made our vacation so much more memorable. We connected in ways we wouldn't have if we had stayed in a hotel. With Beautiful Places' concierge services, we had much more fun, because we experienced the valley from an insider's view. At the end of the visit we totaled up what we spent. Ultimately the weekend cost less than it would have if we had stayed in a hotel. We saved money on the room and by cooking most of our meals. Staying in the villa we had all the advantages of a luxury hotel with the added privacy and spaciousness of a private home. With summer vegetables appearing in the farmers' markets, a vegetable risotto is a perfect wa y to feature the bounty of the garden. 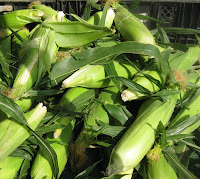 This past Sunday at the Palisades Farmers' Market, we picked up several ears of fresh corn and some baby zucchini. 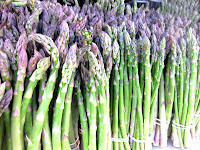 We also bought carrots, spinach, Italian parsley, scallions, green garlic, squash, asparagus, English peas, spinach, and broccoli, any of which would be good in the risotto. To make risotto requires a variety of rice--Carnaroli, Violone or Arborio-- with a high starch content, the source of risotto's distinctive creamy quality. For the liquid, you have a lot of choices: vegetable, chicken, meat, or fish stock, wine, even water with a pat of butter added for flavor. You'll achieve the best results if you use homemade stock with its fresher taste and lower sodium content. Risotto likes a steady hand, stirring frequently for 18-20 minutes. Because the rice both releases starches into and absorbs the stock, there is a window of a few minutes when the rice is simultaneously al dente and the broth creamy. Past that point, the grains bond together, becoming gummy like porridge, which still tastes good but isn't risotto. Those last moments are crucial and the rice wants all your attention. Whatever you want to add to the risotto should either cook in a few minutes like spinach or be prepared ahead and added in those last moments. 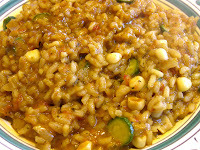 Serve immediately because the rice will keep absorbing the broth even after you've removed the risotto from the stove. Preheat the oven to 400 degrees. Cut out the stem part of the tomato. Put the tomato on an aluminum foil covered cookie sheet, drizzle with olive oil and roast for 30 minutes. Remove, let cool to the touch, peel off the skin and discard, tear apart and reserve the pulp and juice in a bowl. 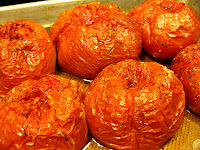 The tomato can be roasted ahead and frozen. That way it is ready and waiting whenever you need it to spice up a sauce or stew or, in this case, a risotto. Drizzle a tablespoon of olive oil into a frying pan. 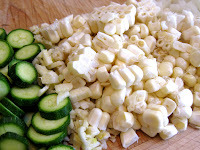 On a medium flame, saute the onions, garlic, and corn kernels until lightly browned, about 5 minutes. Remove and set aside. Drizzle the 2nd tablespoon of olive oil in the pan, season with sea salt and pepper, add the rice, stir and cook for 2 minutes, then add 1/2 cup of stock. The stock will deglaze the pan, adding the caramelized flavors of the vegetables to the rice. Continue stirring. Add another 1/2 cup of stock as the rice absorbs the stock. Continue adding a 1/2 cup of stock at a time, stirring, and adding more stock. Do this for 18-20 minutes until the rice is al dente. When the rice is almost cooked, add back the sauteed vegetables and roasted tomato pulp. Stir well, taste and adjust the seasoning with sea salt and pepper, a drizzle of olive oil or a pat of butter.